What is the Walking Charger™? The Walking Charger is a patented small device that is embedded within branded footwear products. Markets include consumer, commercial work boot, recreation and military applications. The Walking Charger addresses the lack of portable green power. With the Walking Charger, consumers have an off-the-grid capability to charge portable electronic device batteries as they walk. Alternatively, the Walking Charger can also be used to provide direct and immediate power to a wide range of electronic applications such as footwear heaters, GPS locators, and health monitoring. The Walking Charger combines one of the most efficient known electrical energy conversion systems, a Faraday generator with foot powered hydraulics (seen as fluidic insoles). We use advanced materials and novel engineering to produce a simple, robust, unobtrusive, and lightweight electricity generator powered by the wearer as he or she walks or runs. The foot powered hydraulics and knowledge of foot movement allow a maximization of power transfer to be made. The foot-driven system can provide more power than at any other position on the human body and within a small package, resulting in no discomfort or distraction. Competing technologies such as piezoelectric, thermoelectric, turbines, generators and others that were put into footwear failed to achieve commercial success because they could not produce enough power and were not reliable. At first product release for recreation and work boots the power output of the Walking Charger is anticipated to be up to 2.4 watts and 1 watt continuous at a normal walking pace of 5 km/hr (3.1 mph). One hour of walking will charge a Smartphone battery. This is a 20x advancement on related applications. 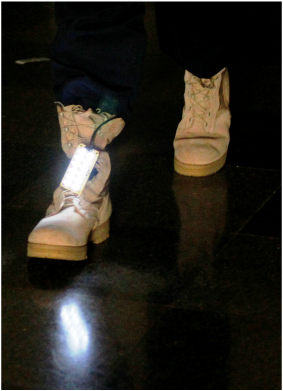 Our 9th Prototype of the Walking Charger™ featured in a military boot. Energy from walking is used to light a panel of 12 LED lights.